Shock waves went through Tuscaloosa, Ala., upon Josh Gattis choosing to leave the University of Alabama football program for Michigan, following his one season of coaching the Crimson Tide’s group of wide receivers in 2018. Despite the productive stats he cultivated, the Tide kept itself in good hands with hiring Holmon Wiggins from Virginia Tech in the offseason. In four seasons with the Hokies (2015-18), Wiggins mentored a two-time 1,000-yard weapon in Isaiah Ford and coached ten 500-yard performers. Before going to the Atlantic Coast Conference, the product of the University of Mexico spent four years at the University of Memphis with receivers from 2012-15. Anthony Miller was Wiggins’ biggest success story. The 5-foot-11, 185-pounder learned physicality from his coach, totaling 694 yards receiving with five touchdowns on 47 catches in 2015 — Miller’s lone season with Wiggins. He would go on to have a pair of 1,000-yard seasons in 2016 and 2017, and be selected in the second round of the 2018 NFL Draft to the Chicago Bears. While he was a running back in college and coached the position to start a new career, Wiggins has taken the toughness of the role and applies it well to receivers. It is a group filled with diva personalities at times; however, he will not have to deal with that trait in coaching the Tide. With it returning a group of targets that averaged 16+ yards per catch and 600+ yards receiving last season, players have already started connecting well with Wiggins. “We got a good relationship with him,” Henry Ruggs III said of Wiggins. He is a speedster, but Ruggs’ toughness – despite being 6’0” and 190 pounds – will draw Wiggins to him. The native of Montgomery, Ala., has an enact for muscling deep passes away from defenders and catching passes in traffic. Ruggs finished second for the Tide in receptions (46) and touchdowns (11) as a sophomore, while turning in 741 yards through 15 games. DeVonta Smith is another wide out that’s enjoying Wiggins so far. 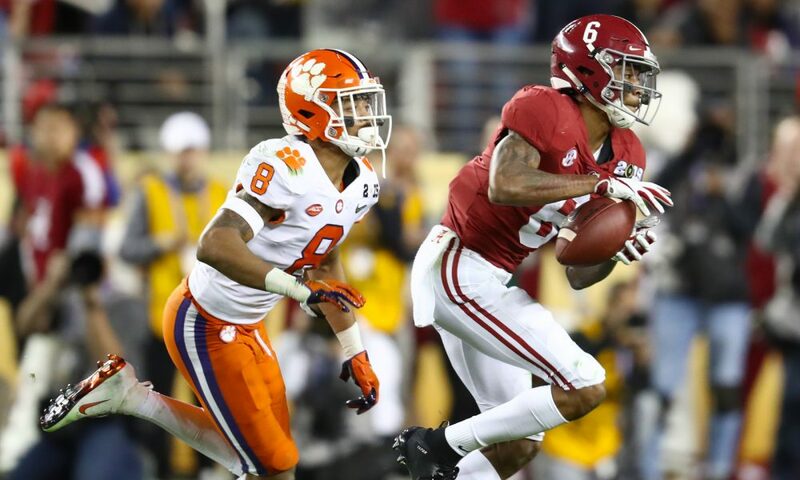 Aside from a historic 41-yard touchdown reception to defeat Georgia in the 2018 College Football Playoff National Championship Game, the native of Louisiana is sometimes the forgotten man of the receiver corps. Smith is not discussed often, but like Ruggs, his physicality and desire to make plays at 175 pounds is unquestioned. Regardless of nursing a slight hamstring issue, he still collected 693 yards receiving with six scores on 42 catches and had the third-highest yards per catch average at 16.50. In speaking with the media on Tuesday for interviews, the former four-star said adjusting to Wiggins has been good. “Just the way he teaches us about being physical. That’s what it comes down to, being physical,” Smith said of Wiggins. Another guy that has toughness, but is known more for his acceleration is Jaylen Waddle. Waddle, a returning sophomore, earned Southeastern Conference All-Freshman Team after a season where he recorded 848 yards receiving and seven touchdowns. He took a punt return for a score and made Alabama’s play on special teams look exciting for the first time in a while. The combination of all three players plus Jerry Jeudy – team leader in catches, yards and touchdowns in 2018 – gives Wiggins the most talented group he has had. Everyone is connecting with him right now and Saturday’s A-Day Game will be fun.